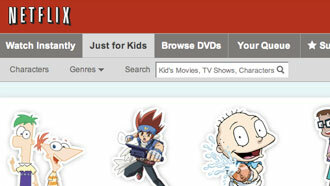 One thing that was previously missing on the Netflix interface was a specific section just for kids. Although there were ways to breakdown titles into kid friendly lists you still had to scan through adult film categories first. Netflix has responded with a section called “Just for Kids” — and made it a main button on their website header. Netflix has arranged part of the kids library in a different way, by providing character cut-outs from various shows in addition to the traditional cover art. This way kids can find their favorite characters more quickly. Kid’s selections were generated by ratings and reviews from Common Sense Media. The interface is currently only viewable through the Netflix website, but support for Wii, iPad, Xbox, and Playstation 3 will be released sometime soon. The improvements were also added for Netflix customers in Canada.